This topic describes how to build a command file that will let you run a deployment using Microsoft Build Engine (MSBuild) project files as a single-step, repeatable process. The deployment method at the heart of these tutorials is based on the split project file approach described in Understanding the Build Process, in which the build process is controlled by two project files—one containing build instructions that apply to every destination environment, and one containing environment-specific build and deployment settings. At build time, the environment-specific project file is merged into the environment-agnostic project file to form a complete set of build instructions. Tells MSBuild to execute the environment-agnostic Publish.proj file. Tells the Publish.proj file which file contains the environment-specific project settings and where to find it. As described in Understanding the Build Process, the environment-specific project file—for example, Env-Dev.proj—is designed to be imported into the environment-agnostic Publish.proj file at build time. Together, these two files provide a complete set of instructions that tell MSBuild how to build and deploy your solution. The Publish.proj file uses an Import element to import the environment-specific project file. Run MSBuild.exe on the Publish.proj file. Specify the location of the environment-specific project file by supplying a command-line parameter named TargetEnvPropsFile. From here, it's a simple step to move to a repeatable, single-step deployment. All you need to do is to add your MSBuild command to a .cmd file. In the Contact Manager solution, the Publish folder includes a file named Publish-Dev.cmd that does exactly this. The /fl switch instructs MSBuild to create a log file named msbuild.log in the working directory in which MSBuild.exe was invoked. Build all the projects in the solution. Generate deployable web packages for the web application projects. Generate .dbschema and .deploymanifest files for the database projects. Deploy the web packages to the web server. Deploy the database to the database server. When you've created a command file for your target environment, you should be able to complete the entire deployment by simply running the file. On your developer workstation, open Windows Explorer, and then browse to the location of the Publish-Dev.cmd file. If an Open File – Security Warning dialog box appears, click Run. If your configuration settings and test servers are set up correctly, the Command Prompt window will show a Build succeeded message when MSBuild has finished processing the project files. If this is the first time you've deployed the solution to this environment, you'll need to add the test web server machine account to the db_datawriter and db_datareader roles on the ContactManager database. This procedure is described in Configure a Database Server for Web Deploy Publishing. You only need to assign these permissions when you create the database. By default, the build process will not recreate the database on every deployment—instead, it will compare the existing database to the latest schema and make only the changes required. As a result, you should only need to map these database roles the first time you deploy the solution. 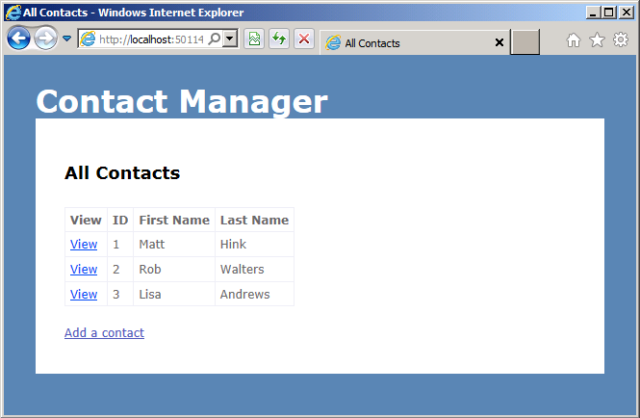 Open Internet Explorer and browse to the URL of the Contact Manager application (for example, http://testweb1:85/ContactManager/). Verify that the application works as expected and you're able to add contacts. For guidance on how to customize the environment-specific project files for your own server environments, see Configure Deployment Properties for a Target Environment. You can also customize the build process for each environment by overriding properties or setting various other switches in your MSBuild command. For more information, see MSBuild Command Line Reference.